What experiences do students have with leading online course providers? What are the advantages and disadvantages of the individual platforms? 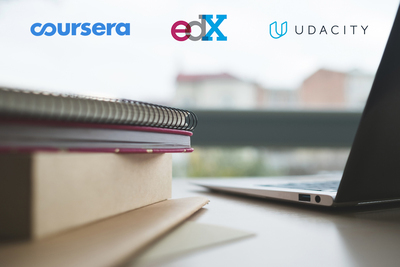 Educational startups Coursera, edX, and Udacity are among the largest providers of college-level MOOCs (massive open online courses) and other high-quality video courses. More than 50 million online learners worldwide (and counting) are using these platforms to train themselves in subjects ranging from computer science to business. Anyone who has ever taken a video course from a top university is likely to appreciate the high quality and flexibility of this learning style. But what are the key positive and negative aspects and experiences users make when enrolling in a course with the big platforms? Differences in Quality: Big differences exist between individual providers and courses. There seems to be a correlation with the reputation of the university: Harvard produces high-quality content not just on campus, but also online. Fees: Individual courses are often accessible for free. If you enroll in a course series or if you need a certificate, you will be required to pay (see this overview on the topic). Prices are usually below $100 per course. Discussion Forums: Communicating with other learners can be helpful. It works well with popular courses, but for niche courses, the forums are less frequented. Course Duration: Some courses are designed to last longer than is actually necessary. This means that some MOOCs scheduled for 4-5 weeks can easily be completed within a few days. Never be deterred by a seemingly long course duration! Course Language: Most courses on Coursera, edX, and Udacity are offered in English. However, presentations from some international lecturers may be hard to understand. Having the transcripts to read along is helpful. User Support: Mostly non-existent. Besides standard FAQs, individual questions are only slowly answered. As an alternative, check out the Reddit communities for Coursera, edX, and Udacity. Of course, we are also happy to help! Has many high-quality university courses from top U.S. universities such as Stanford, Princeton, and Yale as well as international institutions such as the University of London and HEC Paris. Course fees are not immediately shown on the Coursera course pages, unfortunately. To view the fee, you have to click on "Enroll" and register for the platform. This will display the individual price for the course (for paid courses). If you want to take a course without a certificate for free, you can choose the "Audit" option for many courses (when registering for the course). Course series of several online courses are called Specializations. These require payment of a fee (monthly subscription, don't forget to cancel!). However, you can often take the individual courses of the series free of charge (without a certificate). Anyone enrolling for a paid course or Specialization will get access to a 7-day trial period. If you are a quick learner, you can sometimes complete a course within the trial phase (and thus possibly even receive a certificate for free!). Some (not all) of the Personal Development / Career courses have been criticized by users as being rather superficial. Anyone who is already working and has an academic degree may not learn much in some of these courses. A clear advantage over other course platforms is the easy navigation within courses. Videos, tests, discussion forums and further reading materials are easily accessible. For some courses, a final exam with an assessment by other students is required (Peer Assessment). This often works well, but for smaller courses with fewer participants, it may take some time to get adequate feedback for your work. Our conclusion: Leading course provider with good online training content. Tends to offer more and more paid courses. Popular Coursera courses: For example, Machine Learning, Learning How to Learn, Introduction to Mathematical Thinking. Our in-depth profile has more information about Coursera. Founded by leading U.S. universities Harvard and MIT. Unlike the other course providers, edX is a non-profit organization. It has many good and often free courses on a wide range of topics. Navigating the courses is a bit more complicated than with its direct competitor Coursera, especially within the discussion forums. Ultimately, however, it is just a matter of getting used to the format. The video lectures of most courses are accessible via YouTube and are available to download for offline learning. Many courses are available for free without a certificate (choose "Audit" when registering). First-time users of the edX platform can get confused with the many different names for the course series, such as MicroMasters, Professional Certificate, XSeries, Online Master's Degree and Global Freshman Academy. However, most differences are due to marketing. The MicroMasters and the Master's Degree also enable students to get academic credit at U.S. universities. The course availability can also be confusing for learners. Many edX courses will eventually be "archived". This just means that the course is still accessible, but it is no longer actively supervised by the respective university (i.e., no exams or certificates available). In some cases, users have criticized that receiving certificates can take a long time. For courses that run over several weeks, certificates are usually issued at the end of the course. Some courses include a manual exam evaluation by the course team. Our conclusion: Non-profit provider with high-quality academic content. Can be slightly complicated to navigate. Popular edX courses: For example, Introduction to Computer Science, Justice, The Science of Happiness. Our in-depth profile has more information about edX. Udacity focuses on IT courses, including topics such as artificial intelligence, self-driving cars and related technologies. As a result, Udacity is well known as an education provider in this field, but it offers a very limited range of topics compared to the other course platforms. There are free courses and paid course series (Nanodegrees). Sometimes it may be a good idea to take a free course first to get to know the platform (for example, Java Programming as a test course for the longer Android Nanodegree). Udacity users have reported that the course programs contain significantly more hands-on programming work than other course providers. In addition, the fee-based Nanodegree programs offer individual mentor support. Prices for Udacity's Nanodegrees are often more expensive than the course series of other providers. However, the course content is strictly focused on topics that are job-relevant. Courses are created together with well-known companies, such as Google, Amazon or IBM. Sudden price increases have also been reported in the past, for example, from around $500 to around $1,000 for a full Nanodegree program. Our conclusion: Job-related IT courses for professional use. Somewhat more expensive than other providers. Popular Udacity courses: For example, Intro to Computer Science, Intro to HTML and CSS, Intro to Artificial Intelligence. As an independent search portal for online courses from all the major providers, we are often asked about the pros and cons of individual course providers. Therefore, we have compiled the positive and negative user feedback above. Of course, the subjective assessment of our team's online learning enthusiasts is also included. We decided not to create a ranking of the providers. That would not be easy to do by objective standards, and it would probably vary depending on the user, his or her learning objectives and preferences. It is often possible to test providers or courses for free without any obligation. What is your opinion on the advantages and disadvantages of individual course providers? Write us a message or get in touch via Facebook! You can search 8,000+ MOOCs and other online courses from more than 50 providers and 22 subject areas in our directory. This includes courses from Coursera, edX, Udacity, FutureLearn, and others. With our free Course Manager, you can organize your online courses from all providers. If you are interested in online education, you can subscribe to our newsletter here. And follow us on Facebook and Twitter!